Józef Robakowski. My Own Cinema is a new publication portraying a precursor of the film neo-avant-garde and the co-creator of the video art scene in Poland. An artist whose image combines that of an experimenter and media analyst with those of an anarchistic neo-Dadaist and self-declared nihilist; heir to the traditions of the avant-garde, enthusiast for cultural peripheries, valued teacher, and indefatigable opponent of institutional hierarchies. 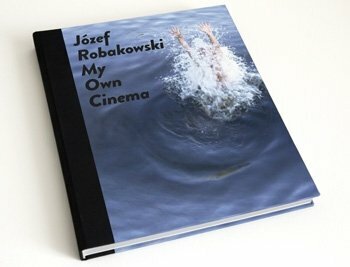 The publication offers an insight into Józef Robakowski’s artistic practices, which are viewed from two different, yet interlocking perspectives: “expanded cinema” and “personal cinema.” On the one hand, it examines the artist’s participation in the neo-avant-garde rebellion of the seventies, for example, as co-founder of the Workshop of Film Form (1970–1977), a key formation for the next generations of creators and investigators of new media art. And on the other hand, it presents an artist working out an independent position for himself within the framework of the concept of “personal cinema”, which would gradually become even more personal. A cinema for which the creator proposed a personal script for perceiving the reality of actual socialism and in which the privacy strategy assumed the hallmarks of a political gesture. The publication contains discussions of the artist’s experimental expansion of the traditional conceptual boundaries of cinema; his early films, which presented a challenge to viewers’ perceptional habits; his video productions, in which he became an astute critic of media portrayals of reality; and finally, the quasi-autobiographical “personal cinema” recordings which Robakowski both created and appeared in as a protagonist. The book, which was edited by Bożena Czubak, includes an interview with Józef Robakowski conducted by Hans-Ulrich Obrist, and texts by the following three authors: Bożena Czubak, Łukasz Ronduda and Mark Nash. In the expansive interview, the artist talks of the beginnings of his artistic biography, locating it within the geo-political context. The visual documentation covers both the artist’s works, beginning with early photographs he took in the ’50s and frames from his first film (completed in 1962), and also photographs documenting Robakowski’s involvement in the activities of the artistic alternative and his participation in various kinds of activities developed in opposition to the official art circulation.